She stretches ,yawns and breathes . And all about her yearns to break out and sing the sun’s song to the trees. Close your eyes, listen;listen for the birds. Those birds who fled in colder times,are winging back for kinder climes. http://bbc.in/1PKmTUa Snowbound with Jarvis Cocker. St Canna’s Church at Llangan, W.Glamorgan. Some 3 miles NW of Cowbridge, is the 12th century church of St Canna. In the churchyard just a little NW of the church stands a sculptured wheel-head cross, 1.3 metres in height – the carving dating from the 9th century, though the actual stone could be earlier. It stands under a 19th century shelter, similar to a lychgate but smaller in size. The cross-head dedicated to St Canna, has on it’s front-side, a crucifixtion scene with Christ on the cross and a person at either side. 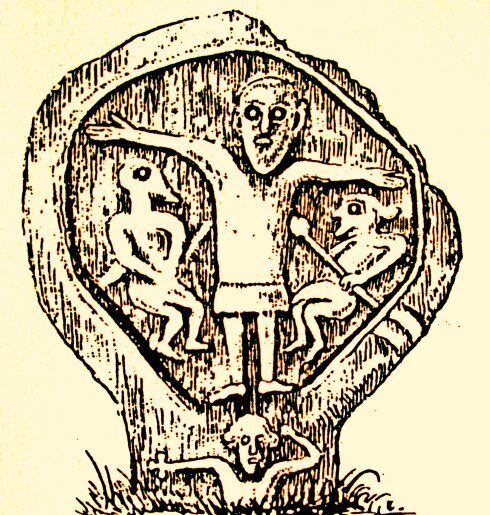 The right hand figure could be holding up a swab on a long pole (St John) or it could be St Longinus the centurion piercing the side of Christ with his lance, whilst on the left side a figure with a strange-shaped head appears to be crouching down. This figure could be the devil. The figure below Christ seems to be stretching out his arms in thanksgiving and holding a small cross in his hand. The reverse side of the cross bears a plain Greek cross. The churchyard is circular indicating that the site is a pre-Christian one. St Canna was a Breton princess, daughter of Tudur Mawr, who came to Wales in the 6th century with her husband, St Sadwrn, and her son, St Crallo. They became active Christian missionaries, each founding their own church. Near the church is Ffynnon Ganna – St Canna’s Holy Well. There is another Llangan, in Dyfed. When the days are the shortest, and the nights are the longest;And the year is the oldest and the Earth seems to topple and rest before it turns once more. November was soft and gentle.The shorter evenings were welcomed with log fires and candles as the world curled up for another season of sleep and quiet dark rest.I hoped for snow once more . Once more no snow came, nor frost ,all storms were yet to come .